NHL Central Scouting says: Pro size goalie with excellent quickness and athletic ability – solid competitor with very good work habits – strong legs for efficientt east/west lateral movement – good quickness getting from post to post – strong on the post to prevent wrap around attempts – very strong technical approach – exhibits a solid stance and plays with authority – overall very good net coverage and good angle play – quick to snap and extend his pads to protect the low corners and also seals the ice and five hole – smart reading the cross ice or back door play. NHL Central Scouting says: Technically very sound approach – positional play is excellent; always gives himself a good chance by being in the proper position – solid stance and sets square to shots – excellent post retrieval – always well balanced – very composed with great focus and concentration – tracks pucks very well through traffic and smart anticipating play – crease management skills are very good – lateral movement is very controlled and well balanced – effective game corralling pucks behind the net and moving pucks – good overall rebound control – very reliable and capable to handle playing majority of games. NHL Central Scouting says: Highly intelligent defender with exceptional vision and offensive instincts – reads the play extremely well – passing ability allows him to be a constant threat in his team’s transition game – one of the top offensive defenseman in the CHL – magician-like when quarterbacking the power play – effective using a variety of shots; has an accurate one timer that needs to be respected – plays a prop style game with composure. NHL Central Scouting says: Effective two way defenceman who can move the puck – good transition game and looks to advance the puck quickly – handles and moves the puck well at the offensive blue line; good shot on power play – effective positioning self and uses a smart stick to puck technique in defensive zone – competes hard and employs a physical element when needed – plays against opposition’s top lines every game. NHL Central Scouting says: Very sound two way defenseman – good straight away speed and has good mobility – defends smartly playing a strong positional game utilizing a good stick and body position to eliminate opposing players on the play – very good gap awareness – effective one on one game in the defensive zone with good compete and battle – plays with poise and confidence – quick in transition; smart at reading and reacting to situations in all zones – makes good decisions with the puck under pressure finding open outlets; good game at offensive blue line. NHL Central Scouting says: Excellent skater with elusive speed and mobility – always a threat when the puck is on his stick – looks to lead or join the rush; loves to generate offensive chances – a “go to guy” to quarterback the power play – vision and play execution are exceptional – makes plays from the offensive blue line that end up on the high light reel – one of the more offensively gifted players in the draft class. NHL Central Scouting says: First year playing in North America and acclimated himself from game one – strong and balanced skater for his size – mobility and instinctual awareness make him almost impossible to check – execution on breakouts is near perfect; quickly able to skate and think his way out of any situation – very poised and smart game handling and moving the puck in all zones – game is tailored for the modern-day NHL puck moving, puck possession defenceman. NHL Central Scouting says: Good size and skating assets- quick and agile skater to be on top of plays / loose pucks – very good game collecting and advancing the puck up ice – knows how to play within limits and keep plays simplified – plays a smart defense first style and has quick instincts to react effectively to make good offensive choices with the puck – composed style of play with and without the puck – very reliable and consistent game. 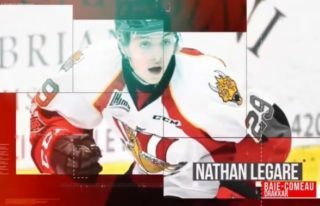 NHL Central Scouting says: Highly gifted centre with deceptive offensive abilities and instincts – possesses high end puck skills and can be very clever in one on one situations – displays good vision with the puck and can execute skilled plays in traffic – high hockey IQ and ability to anticipate the play make him an important figure on his team’s offensive attack. NHL Central Scouting says: Energy player who always is competing and battling on the play – heads up game with the puck, capable to make plays while being checked & willing to take the hit to make the play – plays bigger than his size and has a knack for drawing penalties – fluid skater with good speed & quickness to gain advantage on plays – good offensive hockey sense, makes the give & go plays to generate chances -great instincts to makes the most his chances & has a good finishing touch- small but very effective. NHL Central Scouting says: Good sized forward that has really taken a step this year – good size and reach asset which he utilizes effectively on plays – more of a playmaker then a shooter right now – responsibles game away from the puck – plays and skates his position well – has solid potential as a two way type of forward that can chip in some offence. NHL Central Scouting says: Excellent skater that is always in constant motion on the ice – exceptional speed to pull away on plays – creates opportunities from his speed and work ethic – smart and patient player that executes the details well and is relied on in all situations by his team – good vision and ability to make plays in tight spaces – strong compete and battle game on pucks and to the net – a valuable component to any team. NHL Central Scoutings says: Very good offensive hockey sense – has a good puck composure game and effective at making plays at top speed – has quick hands that can mesmerize the best defensive defender – high end puck skills make him capable of being a game changer – a player you want on the ice when you need that important goal or someone to set up a scoring chance – solid competitor who never gives up on a play or puck. 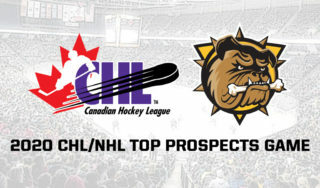 NHL Central Scouting says: Smaller dynamic skilled player – first year in OHL and plays like a veteran – very quick and powerful stride with skater – good quickness and acceleration – uses his speed as an asset on the forecheck or when reacting to a loose puck – smart player with good vision and passing skills – plays in important situations including the power play and penalty kill – good compete and battle in all areas of the ice. NHL Central Scouting says: Good sized two way player that competes on the puck and to the net – nice hands and puck skills to make plays with limited time and space – good offensive hockey sense; sees the ice well and has a good finishing shot – solid game below the dots and can generate offense off a strong cycle game – makes good decisions with puck to generate chances. NHL Central Scouting says: Skilled forward with very good vision and puck skills – very good playmaker –quick read and react game to take advantage of scoring chances – distributes the puck quickly with tape to tape passing – good skater who can make the plays at top speed – makes smart decisions with puck in all zones and shows good patience with puck under checking pressure – Swiss born and speaks four languages. NHL Central Scouting says: Good size/strength winger – very good puck skills and ability to always be open for scoring chances – good vision and playmaking abilities; decent finishing touch – strong on the puck and very good puck protection game – effective puck control game down low and along the wall – patient to make good decisions with the puck. NHL Central Scouting says: Skilled offensive player with a strong work ethic – very good skater who uses his speed and quickness to create opportunities – smart player that plays both ends of the ice and supports his defense down low – composed game with puck and good vision to find open teammates – generates chances with his skating, smarts and skills – competes game in and game out – high character player who leads by example. NHL Central Scouting says: High end skilled forward with excellent play making ability – very good vision, excellent anticipation and exceptional natural instincts to be able to be open on the play – strong puck skills; has a quick and accurate release shot and looks to shoot – exhibits good quickness and speed that makes a difference on plays – reliable and committed to playing a two way game – top five in QMJHL scoring most of the season and played for Czech Repulblic U-20 at 2018 World Junior championships.